International Festival of Athletics Coaching will be held in Glasgow, Scotland, 25-27 October. This year’s program is an exciting mix the highest quality keynotes and workshops; and a preview of European athletics coach development ideas for the journey towards Rio de Janeiro 2016. There is as always a world class line up of experts generating input to raising the bar of coaching from personal to national to European level. The program for 2013 seeks to emphasize the practical art of coaching, while synthesizing the science of coaching. The goal is to equip coaches for getting their decision making right in leading the process of elevating athlete performance. So the focus is about learning how to be more effective in our coaching role, to deliver on agreed performance and coaching objectives, be they teaching stages for beginner athletes or delivering on the day for elite. But it is also about affording you an enjoyable and enriching experience in a city preparing for the Commonwealth Games 2014. And this year, it is a new look experience! Benke Blomkvist, head coach for Sprint Hurdles and Coordinator for Sprints and Hurdles at Swedish Athletics, will be presenting both practical workshop and seminar at the 2013 edition of IFAC. Working in the UK a few years ago, Benke was a Senior Performance Coach in Wales for two years where he coached a group of athletes including which included the European Champion and current World Champion at 400m Hurdles, Dai Greene. Frans Bosch is professor of biomechanics and motor learning at Fontys University for Applied Science in the Netherlands, and will present on Sunday 27 October at the International Festival of Athletics Coaching 2013 on high speed running mechanics. The Dutchman has been coaching in the field of athletics for over thirty years, working with elite sprinters and jumpers. His most notable work has been with the high-jumpers Wilbert Pennings (the current Dutch record holder for the event) and Tora Harris (former US high jump champion and World Student Games gold medallist). He is currently the sprint consultant to the Wales Rugby Team, who claimed the Grand Slam at the 2012 Six Nations Championships and retained their Six Nations title earlier this year. Bosch has a unique approach to sprinting biomechanics and training, focusing on positive running with the ‘BK method’ which he co-developed with Ronald Klomp. 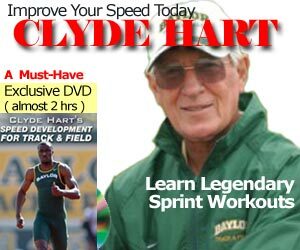 The two also authored “Running: biomechanics and exercise physiology applied in practice,” widely regarded as one of the top sprinting resources for coaches worldwide. There are 5 price points ranging from £70 to £150. Click here for the full price list.